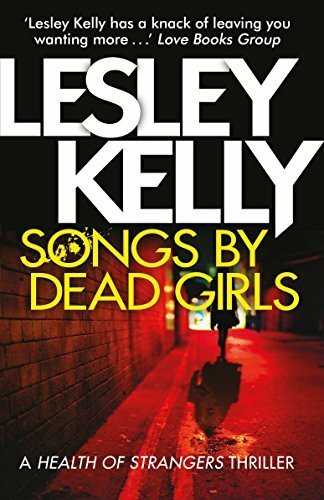 I first met Lesley Kelly when we were both "Spotlighters" in the Crime in the Spotlight slots in 2016's Bloody Scotland. Since then, we have both been involved in "Murder and Mayhem" book events across Scotland and have met up many times. 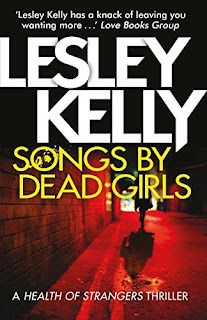 Last week, I reviewed Lesley Kelly's latest book Songs by Dead Girls. You can read the review here. 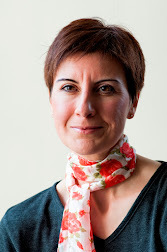 This week, I'm delighted to share my interview with her. Your third book, “Songs by Dead Girls” has just been released. This is the second book in the Health of Strangers series. Tell me a bit about it. When Scotland's leading virologist goes missing, Mona and Paterson from the Health Enforcement Team are dispatched to London to find him. In a hot and unwelcoming city, Mona has to deal with a boss who isn't speaking to her, placate the Professor's over-bearing assistant, and outwit the people who will stop at nothing to make sure the academic stays lost. Meanwhile, back in Edinburgh, Bernard is searching for a missing prostitute, while Maitland is trying to keep the Chair of the Parliamentary Virus Committee from finding out quite how untidy the HET office is. Inspiration comes from all different places. We had an inspection at work, which made me think, aha – maybe the HET should be inspected by a politician. Also, a colleague joined our work having previously worked in an organisation with a clear desk policy. She made us tidy up. A lot. With titles, the usual procedure is that I suggest something and my editor says, ‘Hmm, have you got any other ideas?’ I then generate a list of about twenty alternatives, before we both agree that the original title was the best one after all! But Songs by Dead Girls met with early approval from the fine minds in the Sandstone Press office. Although I’m a bit worried that it’s yet another crime novel with ‘girl’ in the title! Your characters are incredibly vividly drawn. How do you ‘find’ your characters? Are you the kind of writer who has pages of notes about each one? They’re all sitting in my head, chatting away to each other. Or, in the case of the HET team, busy fighting with each other. I haven’t kept lots of notes about my characters, but as I’m now writing book number three, I’m finding that I have to keep looking back to the earlier books to remember how old Mona’s mother is, or what Carole’s kids are called. I need to get organised on this. In this book, one of the characters, Mona, is taken out of her comfort zone and dispatched to a different city where no one wants to be helpful. How fun was this to write? And were you drawing on personal experiences? What’s a typical writing session like for you? I know you have to balance writing with both a busy family life and a full-time job. How do you manage? Writing tends to be done in very short bursts, because, as you say in the question I’m very busy! I aim to write 400 words per day, which is a really achievable amount, until you miss a few days and suddenly you need to write 2000 to catch up. I’m very relaxed about where I write (home, parked car, side of kid’s sporting events) and what I ‘write’ on (PC, laptop, paper, dictating into phone). Will there be more from the Health Enforcement Team? When might we be able to read more about Mona and Bernard? Thanks, Amanda, for the questions!